Mortgages: To Lock or Not? Should you pay for an interest-rate guarantee? Some banks are encouraging home buyers to lock in mortgage rates to guard against rising interest rates; however, borrowers should be cautious: Interest-rate locks often come with fees that can eat into savings and can prove costly if rates go down instead of up. What exactly are interest Rate Locks? Rate locks allow home buyers to guarantee a certain interest rate on their mortgage for a specific period of time the most common is 45-30 days. That way, home buyers can plan on a specific monthly payment after they close on their loan. It is one less thing to worry about when buying. 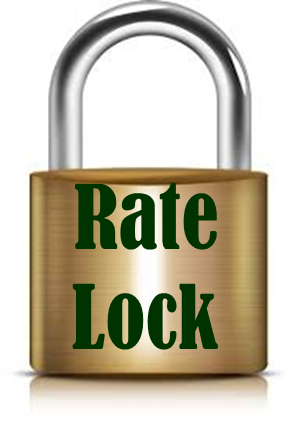 The important thing to know is rate locks are just that, locking the rate and prolonged rates or "float down" programs (they allow you to lower your rate) come at a higher cost. To begin with, rate locks come at a cost. While many lenders offer free rate locks for as long as 45 or 30 days, the amount of time they typically need to process a mortgage (BTW any good lend should be able to close your loan in 30-days). To guarantee longer lock periods lenders typically lock in interest rates above the current market rate, often by an eighth to a quarter of a percentage point, depending on the lender and duration of the lock (these can be as long as a year). Longer-term rate locks cost more. For long term locks, lenders require a "lock deposit", typically from 0.25% to 1% of the total mortgage amount, which is applied toward the home buyers' closing costs or refunded to them after the mortgage is approved. Longer rate locks (up to a year out) could make sense for buyers who are in the process of building a new home and don't want to run the risk of incurring higher rates. For longer locks be forewarned they typically are at a slightly higher and borrowers who decide not to go ahead with a home purchase and cancel the mortgage application likely will lose that "lock deposit". Lenders that don't require a deposit often charge a cancellation fee that can cost borrowers about the same amount. To decide whether the costs are worth it, borrowers should first consider what would happen if they didn't lock in their rate. For some home buyers, rising rates could mean they would only be able to borrow a smaller sum, which could derail the home purchase. On the other hand, home buyers could end up locking in a rate that is higher than the market rate when the purchase is completed. To address that concern, several lenders allow borrowers to "Float Down" the rate lock and get the lower interest rate, in most cases if rates have declined by at least a quarter of a percentage point. Lenders typically charge for this "Float Down" service as well, either with a fee of around 0.25% of the mortgage amount or by raising the interest rate they lock in by around an eighth of a percentage point. Another option is to avoid rate locks and, if interest rates rise, consider paying a fee to secure a lower interest rate. Borrowers who pay 1% of the mortgage amount--known as a point--can lower their interest rate by as much as a quarter of a percentage point. The strategy can lead to greater savings than an extended rate lock if the borrower holds the loan for a long period. Love this information from Realtor.com below is their glossary of terms with links to sites that expand on each of these. This is great stuff! Welcome to the realtor.com® mortgage terms glossary, featuring 47 frequently-used words and phrases you need to know as a home buyer or a homeowner. Basis Point: One one-hundredth of a percentage point. For example, if mortgage rates fall from 7.50% to 7.47%, then they've declined three basis points. A full percentage point is 100 basis points. Consumer Price Index (CPI): A measurement of the average change in prices paid by consumers for a fixed-market basket of a wide variety of goods and services to determine the underlying rate of inflation. The broadest, and most quoted, CPI figure reflects the average change in the prices paid by urban consumers (about 80% of the U.S. population). The so-called "core CPI" excludes the volatile food and energy sectors. Credit Score: A three-digit number based on an individual's credit report used to indicate credit risk. Fannie Mae and Freddie Mac: The nation's two federally chartered and stockholder-owned mortgage finance companies. Forbidden by their charters from originating loans (that is, from providing mortgage loans on a retail basis), these two Government-Sponsored Enterprises (GSEs) purchase and/or securitize mortgage loans made by others. Due to their directive to serve low-, moderate-, and middle-income families, the GSEs have loan limits on the purchase or securitization of mortgages. Federal Funds Rate: The rate banks charge each other on overnight loans made between them. These loans are generally made so banks can cover their daily cash flow and reserve requirements. The federal government doesn't actually set the fed funds rate, which is determined by supply and demand of the funds. Instead, it sets a target rate and affects the supply of funds through its own purchases or sales of securities. Housing Starts: The Census Bureau's monthly count of the number of private residential structures on which construction has started or permits have been issued. Jumbo Mortgage Loan: A mortgage loan for an amount exceeding the Fannie Mae and Freddie Mac loan limit. Because the two agencies can't purchase the loan from the lender, jumbo loans carry higher interest rate.